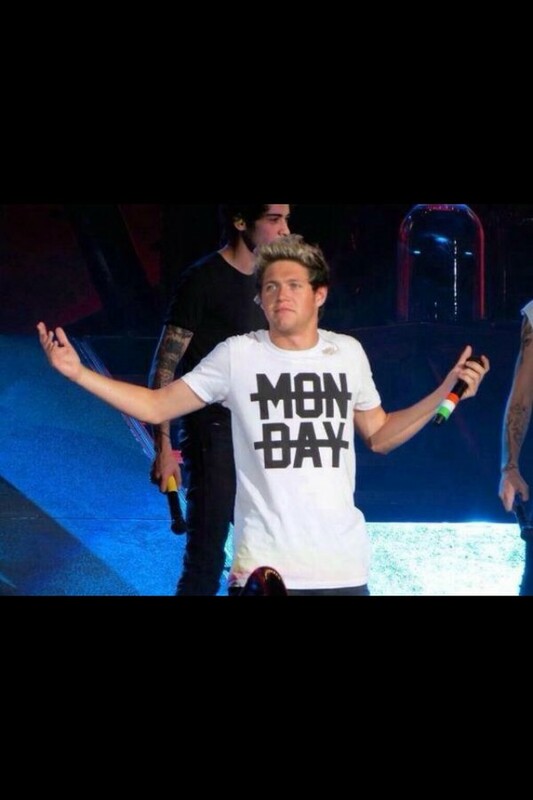 It's Monday, and if you heard any loud screaming near you, it was probably me because One Direction's new album FOUR dropped today and it's incredible! If you haven't heard it yet, please do yourself a favor and go listen to it. It's so different from what Midnight Memories, Take Me Home, and Up All Night were. It sounds a lot older and experimental. You can definitely tell the guys put a lot of hard work into this record and the songs are far from What Makes You Beautiful. So this week the Monday Must haves is going to be the #fangirl edition!!! If this sounds like it's not up your alley, please stick around until the end because it might surprise you. We are going to skip sports because I am going to do a separate hair and a separate makeup section today, because when you are going to see your favorite band you want to look good. Obviously if you are a fan of any band or person, whether it' an author (John Green, anyone?) or artist, fashion designer you keep pretty up-to-date with all that they do personally. But what I find really interesting is following the people who actually help them out with day-to-day activities like hair and makeup, decide what they might wear to events and whatnot. I know if you've followed me for any length of time you've heard about my obsession with Lauren Conrad and her hair stylist, Kristin Ess has 170,000 followers on Instagram because of the behind-the-scenes pictures she posts of Lauren. My favorite follow for behind-the-scenes pictures and fun stuff like that is Lou Teasdale, One Directions hair stylist and makeup artist. She has no fear in trying new things not only with her hair, but with the guys hair (Google Harry Style's hair for the Tampa Where We Are Tour concert and you will see what I mean). She is also one of my personal style icons. I love that she can get dressed up without it looking really dressy, but it still has that rocker/ grunge edge. I love her platinum lilac hair and I love that she absolutely smashes it when it comes to being awesome! Oh and did I mention she's a published author? Her book "The Craft" is great and I blogged my way through it over the summer! So imagine you got front row tickets to whatever concert you want and you have no idea what to do. You are getting ready and it's time to do your hair. Now for me, I have super long thick hair and I find that I hate wearing it down for concerts, especially if they are outside at an amphitheater or stadium. It gets in the way while I'm dancing and I end up messing with it all night and eventually putting it up, when I could have taken 10-15 minutes while I was getting ready to actually do some super cool braid. 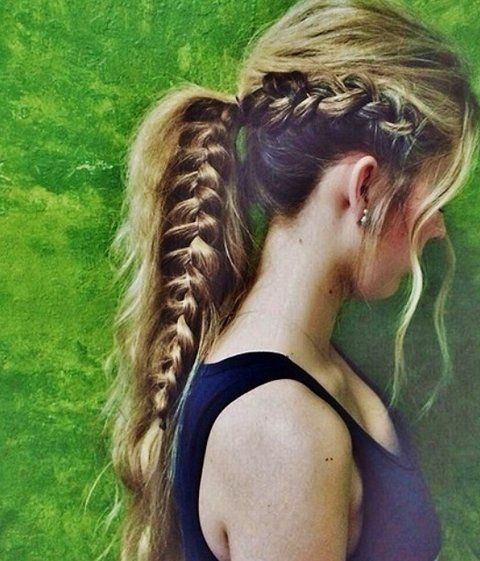 I love this one where the side braids are more like cornrows, and it goes into the ponytail pieces that are still loose. It might take a little bit of practice, a lot of sea salt spray and a few bobby pin, but in the end you will be so relieved to have a cute hairdo, and by the middle of the concert you aren't putting your hair up in a messy bun trying to imitate Harry Styles. Going right along with the theme of easy and no-fuss hair, is easy makeup that is not going to smudge, crease, sweat off, and generally just look good from the moment you walk through the turnstiles to the final bow from the band. And while everyone else is going to be doing cat-eye eyeliner, you have to mix it up. Right now I'm loving gold eyes! 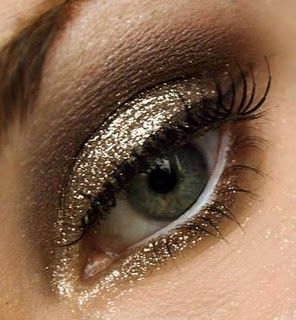 I love that you can make gold smokey, or go super simple with an easy swipe of the color across your lid and be done. I really love Maybelline's Eye Studio Color Tattoo in the color in "barely branded" as a base. Then I use my Smashbox palette to add a deeper gold and create a gold smokey eye, and put a matte brown in the crease of my eye. This picture is a great reference for what I would do to go to a concert, though it is not my eye. I love the guide that the photo gives. You have your hair done, your makeup looks great, now it's time to get dressed! I love wearing dresses as much as the next person, but to a concert, no. You are in close proximity to the person next to you, the seats are super close and you can never cross your legs. Let's just say the weather is perfect and you can wear whatever you want and not pass out from heat exhaustion. I'm going with black skinny jeans, black ankle boots, and metallic top. I love these boots from Aldo, they are kind of expensive but definitely worth it! I also love this top from Nordstrom, which is way out of my price range unless for some reason I win the lottery. But there are some great knockoffs and look-a-likes out there. Obviously there is no other option for this section than One Direction's FOUR! It's absolutely incredible, and like I said earlier if you don't like One Direction this record will change your mind. The songs sound a lot like a combination of The Beatles, The Rolling Stones, and every other awesome 80's power ballad band mixed into one, but it still has the distinct sound of One Direction, if any of that made sense at all. I still haven't decided on a favorite song yet, but I'm leaning towards "Girl Almighty" "No Control" or "Clouds." 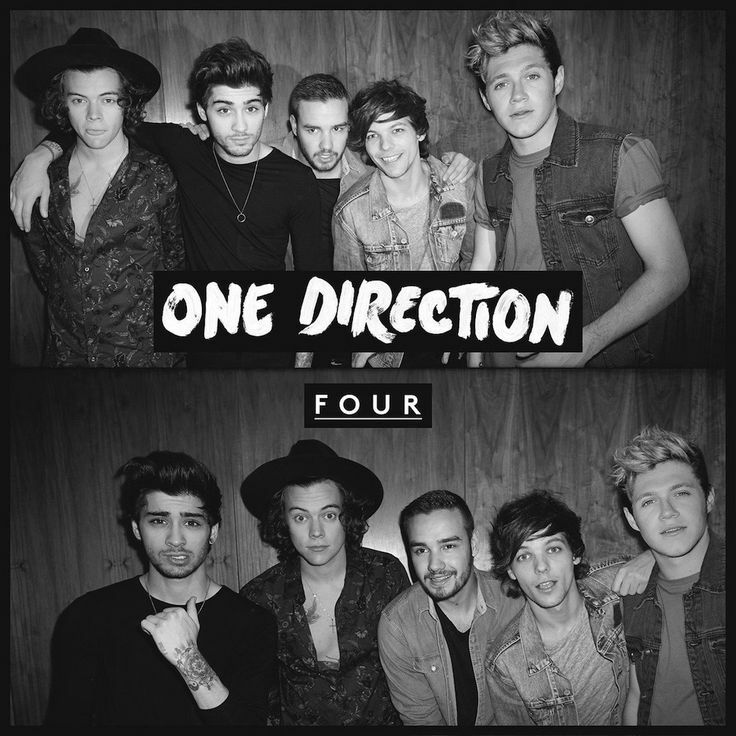 In fact, I'm going to go ahead and say that my favorite song on FOUR is "Clouds" because it's just fun. It's a song I can just dance and sing-a-long with effortlessly. Well that's it for this week' Monday Must Haves! Let me know what you think of it. Tell me how you would wear your hair and makeup to a concert, what you would wear and who you are going to see! If you're listening to FOUR let me know what your favorite song is on the record!